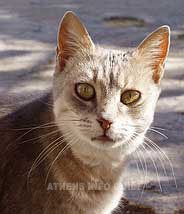 The Athens cats are very nice to watch. You will mostly find them laying around or playing in the National Gardens as well as in Anafiotika but they also very well may pass you by when you are sitting on the terrace of a cafe in Plaka, stop, look at you and continue their way. The Athens cats are clean and healthy. Of course there always can be the odd one that has a few foreign flees visiting Athens. From half of May on, you will see the kittens strolling around. They stay near the terraces and will play with you or sit on your lap and purr. There are a lot of stray dogs in Athens. To some they are a problem, to others a part of what Athens has to offer. They are fed by both locals and tourists and you can see them having a siesta in the shade on a warm afternoon or strolling around alone or in packs. Most of them have their own territory that they will defend from other dogs. You may not believe this but the Athens dogs are pretty smart and very well adjusted to life in the city. Don't be surprised when you see a dog go to a pedestrian crossing, wait for someone to come and cross with him or her. The center and Plaka dogs behave very well and are of good nature. They are used to having a lot of people around. There may be one that has a bad hair day and barks at you. "Bark" back at him and he will run off and when he does not, just ignore him. After a while, he will do the same with you.